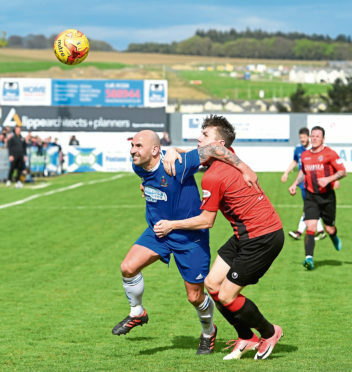 The Highland League champions head to Central Park on Saturday with the tie delicately poised at 0-0 after John Sheran’s men passed up a series of excellent chances. Mathieson admitted his side should be taking a healthy lead into Saturday’s second leg at Cowdenbeath. Mathieson said: “We thought we played ourselves into the game last weekend. We weren’t sure how they would play on the day but we were patient and dominated the second half. “We probably should be going to Central Park leading 3-0 or 4-0 going on the chances we created. “Saturday will be much the same. “We will need to be patient but this time it is imperative we take our chances. “We defended really well against Cowdenbeath last Saturday. “We didn’t allow their big striker (Jordyn Sheerin) any space and hopefully we can do that again as we will be as well set up defensively as we have been all season. “I felt we got ourselves into a lot of good positions on Saturday. It’s certainly not like Paul McManus and Mitch Megginson not to take one of them but it just turned out to be one of those days. “Their goalkeeper David McGurn is a really good shot-stopper. He made some good saves, one in particular when he diverted a Jamie Masson effort round the post with his legs. Mathieson says everyone associated with the club is aware of the importance of Saturday’s match. He added: “This is the biggest game in the history of Cove Rangers. “We will go there looking for a win but I know how difficult it is going to be.